English pianist, composer, and controversialist; born in London March 3, 1814; died there June 23, 1901. His musical talent became apparent at a very early age, when he studied under Neate (a pupil of Beethoven), Crotch, and Eley. Playing at the suggestion of J. B. Cramer before the Royal Academy of Music, he was elected, at the age of ten, a member of that institution. In 1828, when only fourteen, he played compositions of his own in public. After studying in Paris under Henri Herz, he reappeared in London, and was in 1830 selected to compose the ode for the Shakespeare Jubilee Festival of that year at Stratford-on-Avon. At Salaman's first orchestral concert, in 1833, Grisi was introduced to a London audience. In l836 Salaman published his still well-known setting of Shelley's "I Arise from Dreams of Thee"; and until his death he steadily produced numerous songs, delicate alike in melody and in style. The poems which Salaman set to music were noticeably chosen from a wide field, covering most European languages as well as Latin (Horace and Catullus), Greek (Anacreon), and Hebrew (Judah ha-Levi and the liturgy). From 1845 to 1848 he was in Rome, conducting the first performance of a Beethoven symphony there, and being present at the removal of the gates of the ancient ghetto (on Monday evening, Passover eve, April 7, 1847). He received the rare distinction of honorary membership in the Academy of St. Cecilia. On his return to England he founded the Musical Society of London, acting for several years as its honorary secretary, and organizing the orchestra, which Meyerbeer pronounced magnificent. He became prominent also as a public lecturer. Salaman's attention had early been turned to devotional music, and he produced several anthems which are prominent in the repertory of the Anglican Church. 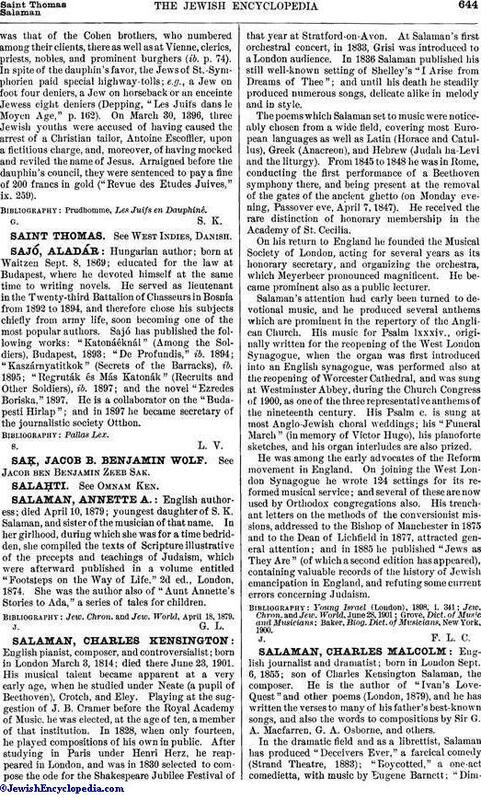 His music for Psalm lxxxiv., originally written for the reopening of the West London Synagogue, when the organ was first introduced into an English synagogue, was performed also at the reopening of Worcester Cathedral, and was sung at Westminster Abbey, during the Church Congress of 1900, as one of the three representative anthems of the nineteenth century. His Psalm c. is sung at most Anglo-Jewish choral weddings; his "Funeral March" (in memory of Victor Hugo), his pianoforte sketches, and his organ interludes are also prized. He was among the early advocates of the Reform movement in England. On joining the West London Synagogue he wrote 124 settings for its reformed musical service; and several of these are now used by Orthodox congregations also. His trenchant letters on the methods of the conversionist missions, addressed to the Bishop of Manchester in 1875 and to the Dean of Lichfield in 1877, attracted general attention; and in 1885 he published "Jews as They Are" (of which a second edition has appeared), containing valuable records of the history of Jewish emancipation in England, and refuting some current errors concerning Judaism. Baker, Biog. Dict. of Musicians, New York, 1900.